One for you newbies to introduce yourselves and show us your ZXR! Anyway, it is G reg, 1990, just under 21000 kms. It was advertised as a H1, but the VIN number site shows it up as a H2 ? 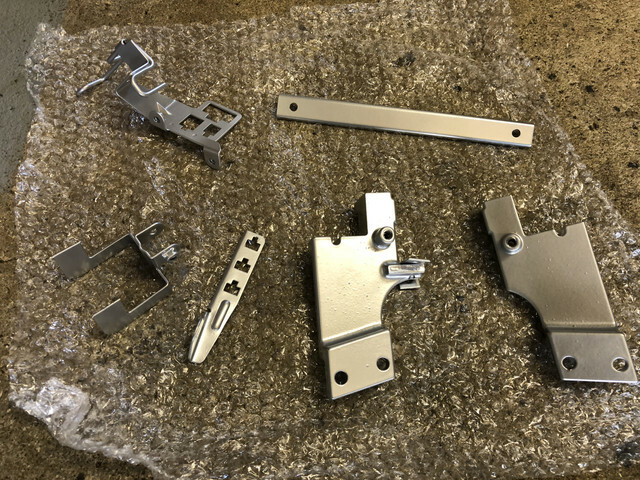 The frame and a few bits have gone off to be cleaned up/aqua blasted, then powder coated to the factory looking silver/aluminium colour. The wheels have been stripped and resprayed Kawasaki green, all new bearings, tyres, valves, etc. The calipers have also been completely stripped and new pistons/seals, etc. installed with new SPS pads and branew new HEL braided hoses (2 hose set up on front instead of using the splitter) purchased. Been working on the engine the last few days, sump off, completely cleaned and sprayed up, all the bearings, etc inside look clean. So will clean up the rest of the engine, spray it and then new gaskets all around. While donig this, I checked the thermostat and sender unit housing, and it looks like the bike may have been run with just water in the past , as there was dry white powdery bits at the point where the hoses were connecting to the housing. So the bits were removed, and I have cleaned that up, but I discovered the hose that goes from the water pump to the radiator is cracking, so I really want to get new hoses (which I was planning to get anyway). But this is where I am stuck. The radiator I have is the curved one - is that the correct one for my bike ? Some sites seem to say the flat one is the correct one ? Just need to be sure whether I need get the 3 hoses (1 small, almost 90 degree hose, then the one that's like a flat C shape, and finally the one from the water pump to the rad ? Any H2 owners have pics of how the radiator is mounted and hoses (if possible) so I can compare please ? Firstly, the curved rad is the correct one for an H2 model which is better as it has a larger surface area and is easier to both check and top up if required. 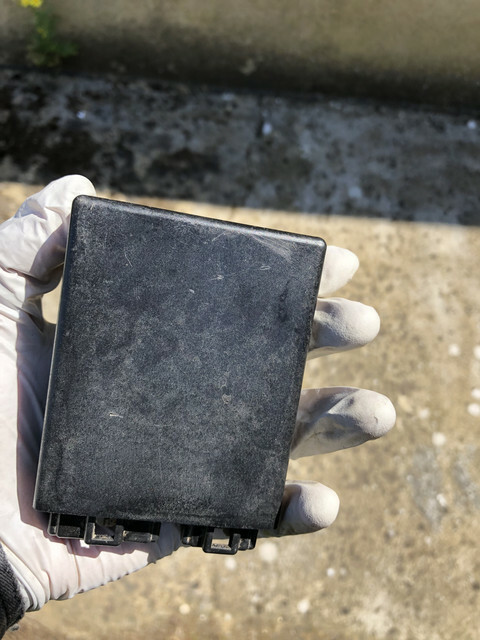 The H1 has a rectangular shaped rad and is much smaller, however the pain with the H1 is that in order to check the coolant level you have to remove the tank and air box. 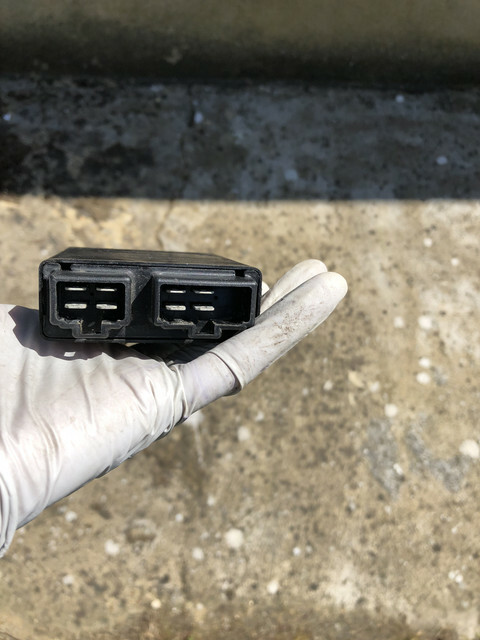 The radiators are interchangeable between the two models, but the hoses are different and the H1 requires a number of addititional part for both the rad and the oil cooler to be fitted. 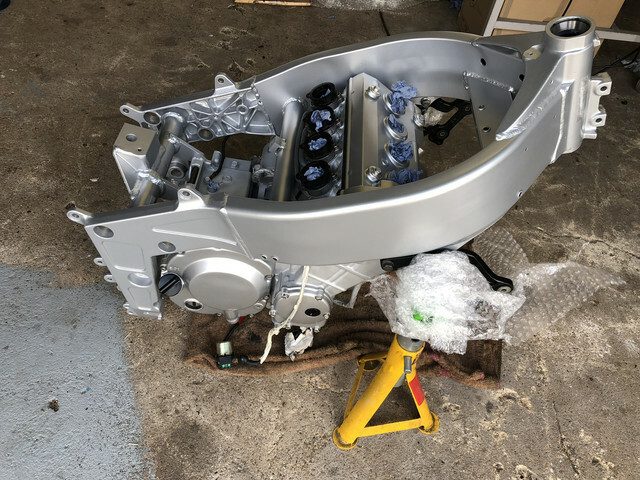 The oil cooler on the H2 will only fit an H2 rad as it connects directly to it, whereas the H1 oil cooler requires brackets to be fitted to the upper engine mounts. Basically, you are better off sticking with the rad you have. You can still pick up a new hose that connects the water pump to the rad for the H2 and Samco do not manufacture a set for the H2. The hoses between the H1 and H2 are different, although I'm unable to confirm if the one you are after to replace the cracked hose is the same as a H1. Thank you for the reply and information. Good to know the H2 rad is the better choice to have, I just wasn't sure if I had the right bits. 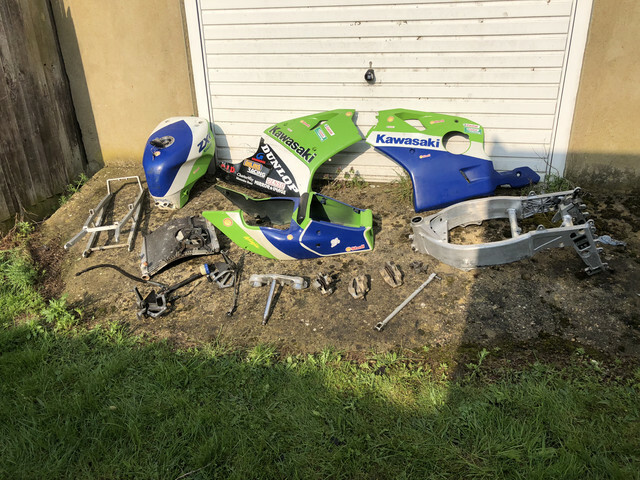 Here is a pic I had taken of some of the items the day I picked up the bike...does the rad and the fairings look correct for the bike ? So I fill up the rad on the top left corner where the cap fits (when looking the bike from the front) ? Do the fairings/tank not need to come off to be able to access that cap ? The radiator cap is accessible without removing anything. Does the bike have a speedo in KPH, and is there no side/headlight switch on the right hand clip on? If there is a "yes" to these, the bike is likely to be an import. That means the top speed is restricted. Check the speedo for a pink wire, which connects to the CDI. That will limit the bike to 100mph. There are several ways of sorting this: a small blue gearbox which is inserted between the speedo cable and the speedo. This gears down the turns of the inner cable so that the KPH speedo will actually read MPH, increasing the top speed. Another method is using a little electrical box of tricks to which the pink wire is connected and somehow it prevents/reduces the signal to the CDI. There is also a thread on this site which shows how to install a resistor in the loom to defeat the effect of the pink wire, and another showing how to open the speedo and remove the tab that activates the CDI. Or you could get a MPH speedo and an unrestricted CDI with a letter L or M which will allow full power. Since the bike is 30 years old it would be a very good idea to check the wiring loom as there could be some corrosion/degradation of the copper wire. There are a lot of threads in which members have experienced problems with the white wire, which supplies power, and the regulator/rectifier. But there is also a manual on the site which details methods of checking the various electrical components. It also has "small" wiring diagrams for specific items, like charging/ignition/lighting etc, which saves time trying to trace wires on the complete wiring diagram. This is an excellent way of learning about the bike and I will be interested to see a few photos of the rebuild. For any more problems you may encounter, do use the search box at the top right first, before starting a thread. Others may have experienced the same problem as you and so the answer may already be there. The speedo is definitely in KMH, but I have bought a MPH one (from a L model, hope it will be a straight swap). I took a look at the wiring loom and this is what I believe is the CDI ? If so, no markings apart from something along the lines of ZXR400 H written with marker pen, faintly visible. Looking closely at the wiring loom, I did find this pink wire. Is that the one you are referring to ? This should show the difference between the two types. As you can see you have an H cdi, with the pink wire. I'm not sure if the wires from the MPH speedo will trigger the cdi. Have a look at the H and L wiring diagrams to compare the destination of each wire. 1. It holds the throttle cables in place where they pass under the frame. 2. It holds the wiring loom that comes from the R/H/S switch gear in place where it then connects to the main loom by means of two electrical connecting blocks. Once these have been disconnected and removed you will then have access. The main difference between the H and L model CDi's is with the left side connection which on the L has 6 male tabs, where as the H has only 4. This can be seen in the picture. Fired up the bike, ran the engine for a few minutes, and it's not bad ! Just a little bit of fueling issue somewhere when it's idling... Carbs were taken apart, cleaned ultrasonically, brand new jets and such used, but I'm told it's not going to work from the 1st go. Nearly there though, as we managed to get the carbs balanced (although without the airbox), and they seeem to be working well. So that is a main area of work in progress. The big puzzle to solve now is how are bits of the wiring loom sat in/around the frame, and I have quite a few brackets that I have no idea where to use. Pic1: bottom row, middle = fairing brackets, fitting either side of the main spar on the frame. Bottom right = foot peg supports. The round pins will have a flat on them to locate in a D shape hole in gear change and brake support plates. Pic 3: top left is the gear change support plate bolting to the left hand lower side of the frame. There should be some large round shallow capscrews for that purpose. Pic 4: top row, third item = fits to the offside rear of the swinging arm to support the brake pipe. There should be a split rubber grommet that fits round the pipe and locates in the circular section of the bracket. Bottom row, second item = fits to the offside lower section of the frame to support breather pipe from the tank. Fourth item = fairing support bracket fits to nearside lower section of the frame. Fifth item = brake light switch support, which fastens to the brake pedal support plate. Have a look at the above for the other items. Scroll down to reach the H model section. I'll get back to you later today with a full breakdown of what goes where, although there are two parts which don't belong to the H model. I'm in the process of a full Resto on an H2 and have gotten to know the parts intimately! Some are very rare and any you can get hold of are normally bent from crash damage. Still no idea how the wiring loom runs and where it sits. For now, it's just sat roughly, while I run the engine and get the mechanical side tested/sorted. But please keep the advice and suggestions coming, all highly appreciated. Look at the handbook for the H in the link. Chapter 1 General information page 12 onwards shows the cable and loom locations. Top left - One sits each side of the frame (on the inside) and is used to bolt the engine upper mounts to the frame. Top and center - This bolts to the inside of the frame and secures the main wiring loom to the loom. It is also the location where the earthing point from the loom is bolted to the frame. 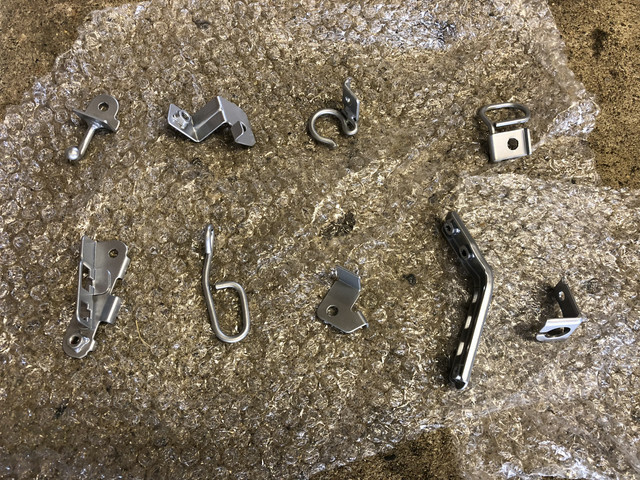 Top right - these brackets bolt on top of the items in pic 2 (bottom right) and are used to attach bungees too etc. The brackets also secure the item in pic 3 (bottom center) to the two parts in pic 2 (bottom right). This part secures the pillion seat to the bike. Center- Bracket securing the wiring loom to the engines upper left side mount and bolts to the outside. Bottom left - Bracket that secures the wiring loom to the rear shock mounting point. Sits on top of the rear shock mounting point and is held in place by the main bolt that secures the shock bracket to the cross spar. Faces the rear of the bike. Bottom and center - Fairing side panels mounting brackets. Bolts to the frame with one on each side. Easy to identify where they go as there are two holes on each side of the frame. 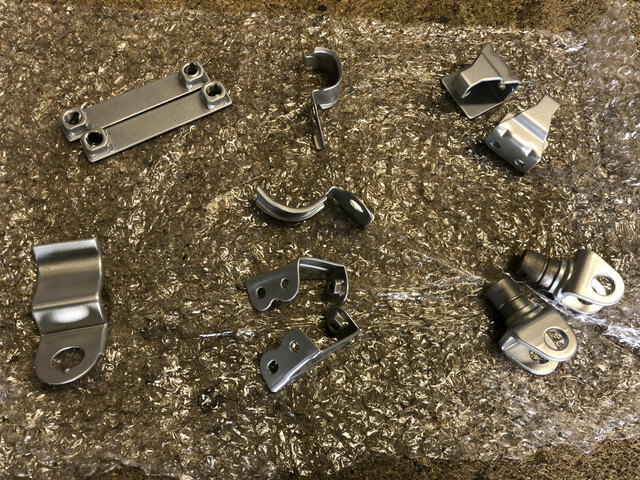 Bottom and right - Front footrest brackets that bolt to each main footrest assembly. Top Left - Bracket bolts to front left side of frame. Secured with one bolt and is used to secure the electrical connections where the main loom and the left side switch gear connect. Top right - Connects between the two parts in pic 2 (bottom right). Bottom left - Bracket that secures the fuel pump to the right side of the subframe. Bottom center- Bracket holds three electrical connections in place; rear brake switch, timing pick up and fuel pump to main loom. Bolts in same place as fuel pump bracket, bolts on the outside. Bottom right - These two parts are bolted to the sub frame and have attached the previously mentioned items. 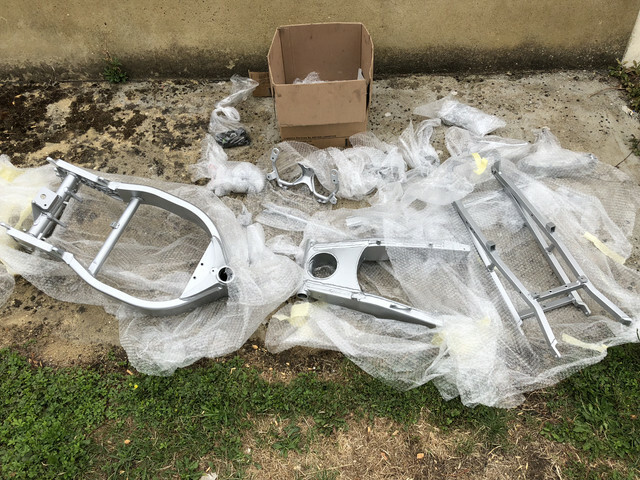 Serves as the main support for the pillion seat and all the items that lock it in place, plus it is a mouting point for the rear cowling on the sub frame. Top left - Left side footrest assembly. Top and center- Same as the part in pic 2 (top left), but sits on the right side. Does the same for the right side switch gear, but note that the part in pic 4 (bottom left) bolts to it. Top right - No idea. These do not belong on an H2. Bottom center - This mounts to the two parts in pic 2 (bottom right) and secures the pillion seat in place. Is held in place with the two parts in pic 1 (top right) and is spring loaded. The spring attaches to this part on one end and them attaches to the rear upper under tray. The seat lock attaches to this item. Top left - Bungee bracket that fits to the right side of the sub frame at the rear. Top second from left - Rear brake reservoir mounting bracket. Top third from left - Holds rear brake line to the swingarm. Sits at the rear end of right side of swingarm. 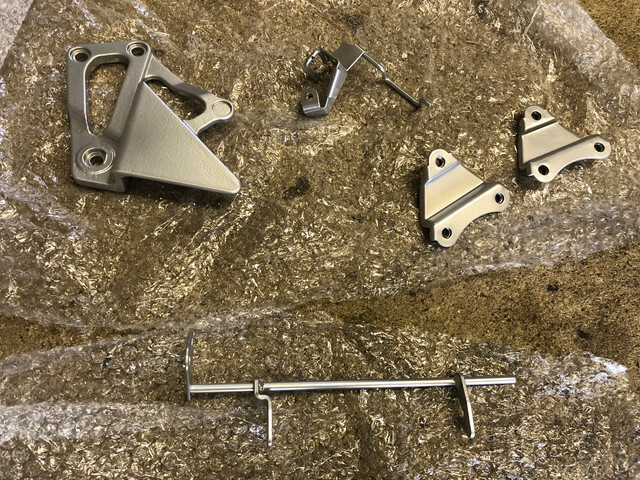 Top right - This holds the clutch cable in place and mounts to the main bracket (for the lights and clocks) that attaches to the front of th frame. Sits on the upper right side of the main bracket. Bottom left - Attaches to the item in pic 3 (top center). Bottom second from left - Slightly bent, but this bolts to the main frame on the right side. Is mounted by one bolt at the bottom of frame and holds all the breather tubes and overflow pipes in place. Bottom third from left - Bracket that holds the fuel filter in place. Attaches to the cross spar on the frame, next to the rear suspension mounting point. Bottom second from right - Lower left side fairing panel mount bracket. Bottom right - Rear brake light switch mounting bracket. Attaches to the right side footrest assembly. Hope this makes sense and helps out. Thanks for all the info, really helpful ! 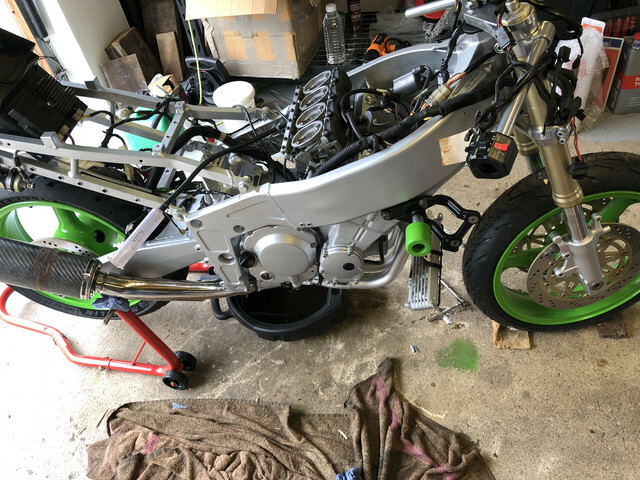 I've had some luck with some items, but not others, so continuing to spend time going around the bike with the bits and try to match them up with the correct mounting spots. May take a pic or two of the remaining ones that don't seem to make sense. On another note, as my bike is a H2, it's an import and has the KM/H speedo and the dreaded pink wire. Now I'm not too bothered about the speed restriction, but I'd really like to have the correct MP/H speed reading. 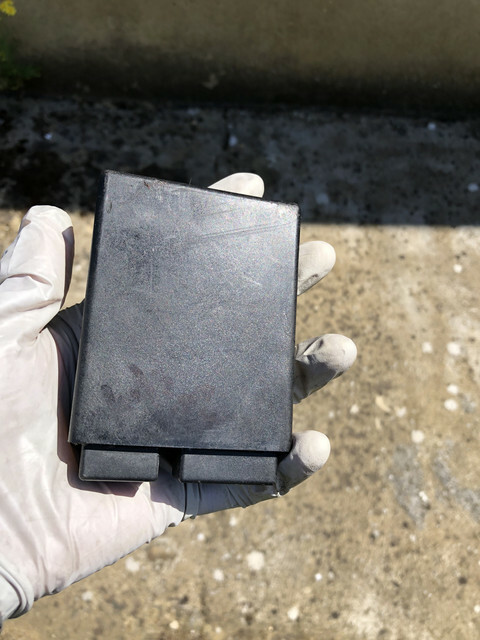 I also managed to find a very clean MP/H speedo on eBay, as my original one has a bit of white paint and will probably need a bit of elbow grease and all that ! 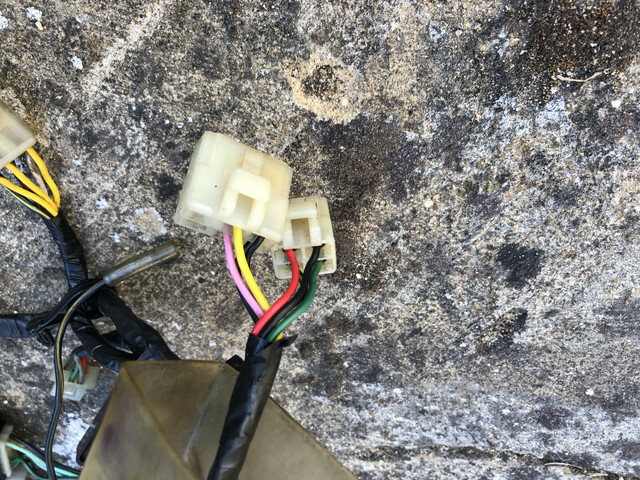 I also noticed that on my original KM/H speedo, there is a cable connector with 3 wires, one of them being the pink. The MP/H, there is no such cable connection. When I connected my original CDI, the bike fired up fine. I am guessing the bike did not like the L-model, although that has a 4-6 pin layout, whereas my A-model CDI has a 4-4 pin layout, so the 2 extra pins must link up to something, or the pink wire is interfering ? Any ideas on this one please ? Thanks.